In this NASA Now classroom video, introduced by educator Kaci Heins from Northland Preparatory Academy, NASA astronaut Greg Johnson discusses the future of space exploration and the logical progression of sending humans to Mars. He talks about sending astronauts back to the moon and the possibility of building a lunar habitat to understand more about working and living in space. Johnson has logged over 5,000 hours in more than 50 aircraft. As part of a series of electronic professional development experiences for educators, the NASA Explorer Schools project and the National Science Teachers Association are hosting a 90-minute Web seminar on Sept. 13, 2012, at 6:30 p.m. EDT. This Web seminar features three lessons for grades 5-8, focusing on a real-world understanding of Newton’s Laws of Motion and addresses common misconceptions associated with the laws. The featured lessons are Rocket Staging: Balloon Staging, Lunar Landing: Swinging Tray and Lunar Base Supply Egg Drop. For more information and to register online, visit http://learningcenter.nsta.org/products/symposia_seminars/NES3/webseminar1.aspx. NASA Explorer Schools educator Lesley Stranger from Sewells Point Elementary School modified the Newton’s Laws of Motion: Lunar Nautics — Lunar Base Egg Drop activity. After completing the lesson in class, the fourth-grade students demonstrated the lesson to their parents, siblings and community members during the school’s Family Math and Science Night. Out of the 17 groups that presented, not once was the teacher needed as a facilitator or mediator. For details on the lesson modifications, read the entry in NEON or Facebook. Students of NASA Explorer Schools educator Dennis Hagen-Smith from Toluca Lake Elementary School completed the Balloon Rocket Experiment from the lesson Newton’s Laws of Motion: Lunar Nautics. This activity is a simple demonstration of rocket staging first proposed by Johann Schmidlap in the 16th century. Hagen-Smith’s students learned how rockets achieve greater distances through staging. They also found out that it takes an enormous amount of energy to boost an object into space. Students were excited to see their balloon rockets move along the tether across the room as they recorded data from each group’s experimental design. As a follow-up extension activity linking social studies, students created timelines showing rocket development. 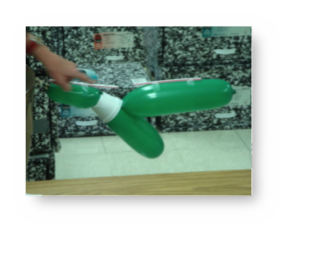 Check out the pictures from this lesson in the Balloon Rocket Experiment entry in the Lunar Nautics forum in the NASA Educators Online Network, or NEON. These hands-on design challenges provide students in grades 5-8 with a real-world understanding of Newton’s Laws of Motion and address common misconceptions associated with these laws. 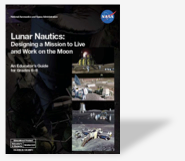 Live, interactive support from NES educator specialist Rudo Kashiri, who will give an overview of the Lunar Nautics featured lessons and answer any questions you may have. Concrete implementation ideas and real-life examples of classroom use. Strategies for addressing common misconceptions with Newton’s Laws of Motion and gravity. Opportunities to connect and collaborate with fellow educators. If you are not able to attend the live session, you can also access on-demand videos of Lunar Nautics on the Virtual Campus at any time. Direct link to the Lunar Nautics registration page. Link to information about NES e-Professional development seminars. A lunar eclipse occurs when the moon passes behind Earth so that Earth blocks the sun’s rays from striking the moon. This can occur only when the sun, Earth and moon are aligned exactly, or very closely, with Earth in the middle. Hence, there is always a full moon the night of a lunar eclipse. Unlike a solar eclipse, which can only be viewed in a relatively small area on Earth, a lunar eclipse can be seen by anyone on the night side of Earth. A lunar eclipse lasts for a few hours, whereas a total solar eclipse lasts for only a few minutes at any given place. Some lunar eclipses have been associated with important historical events. In this NASA Now program, astronomer Steven Edberg from the Jet Propulsion Laboratory in Pasadena, Calif., shines some light on the science behind lunar eclipses. In this episode of NASA Now, Camille Alleyne, Assistant Program Scientist for the International Space Station discusses the unique research environment onboard the ISS while sharing information about many of the past, present and planned experiments. To date, more than three hundred experiments have been conducted on the ISS. Through this research, we will better understand the effects of microgravity on the human body, further develop technology, and expand our knowledge about our Earth and about the universe. Look for this episode on the NES Virtual Campus beginning May 25, 2011. Liz Warren, NASA Johnson Space Center operations lead for the International Space Station Medical Project, discusses why exercise and nutrition are important to maintaining good health on Earth and even more important to astronauts on the International Space Station. She also discusses how living in space causes changes in the human body such as loss of bone density, decreased cardiovascular fitness, and muscle atrophy. Astronauts participate in experiments to measure changes in their bodies so that we can prevent those types of changes in the future. Link to this NASA Now program (requires log-in to the NES Virtual Campus).